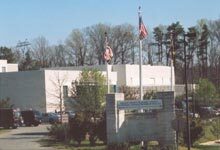 The mission of the Calvert County Detention Center is to create a safe environment for the citizens of Calvert County by securing, in a humane environment, offenders legally entrusted to its custody and care, and to provide viable alternatives to incarceration. These skills will assist them in re-entry and enable them to function as productive members of society. Develop staff through training programs to ensure the maintenance of a safe, pleasant, clean and professional work environment. Conduct daily operations while demanding the highest level of professionalism and integrity from staff who are proud to represent the community and the Organization. Inmates are housed in accordance with a valid, uniformly applied classification process. Equal quality of program services are provided for both male and female offenders. In-house programs, complemented by community volunteers, assist in addressing the needs of those requiring counseling. The Detention Center provides adequately for the safety and security of staff, inmates and the public. The Detention Center will fulfill the basic human needs of inmates to include a safe and sanitary environment, nutritious meals, reasonable medical care, and opportunities for the constructive use of time spent in confinement.